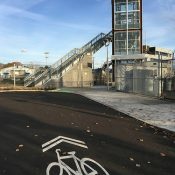 An elevator on a bridge needed for cycling over light rail and railroad lines in southeast Portland has been closed for nearly seven weeks now. And TriMet, the owner of the facility, still isn’t sure when it will re-open. 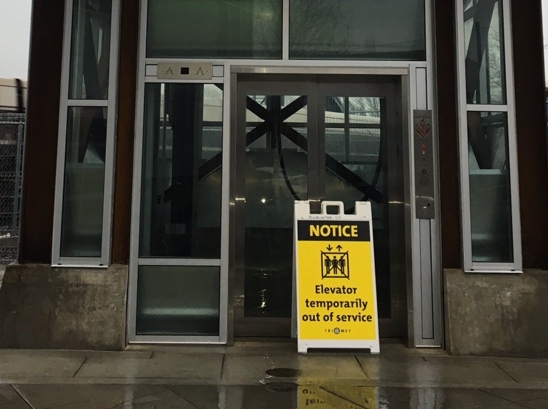 On February 20th we reported that the elevator at the Rhine-Lafayette Bridge was broken. TriMet said moisture had gotten into the elevator shaft, causing the brakes the fail. After posting our story we heard from several readers who were frustrated about losing such an important connection. As you can see in the map below, the railyard splits two neighborhoods and there are very few ways to get across it. While there are stairs with a wheel-gutter, the gutter is hard to use and for many people there are too many stairs to manage carrying their bike safely. The bridge is in red. Note the lack of connections across the railyard. And today, reader Hazel said the fact that the elevator is still closed indefinitely is “absurd”. Once elevator technicians determine how the moisture is reaching the braking mechanism TriMet will be provide an opening date. Stay tuned. And good luck with your detours. From this and other recent news it sounds to me like TriMet is trying to compete with ODOT for least active transportation-friendly agency. With ODOT you can contact your state elected representatives, who are responsible for its leadership. TriMet is unaccountable to people — it’s leaders are political appointees. TriMet is a local government — a municipality. It should have a directly-elected board. Anyone think that structure does not violate voters’ rights? 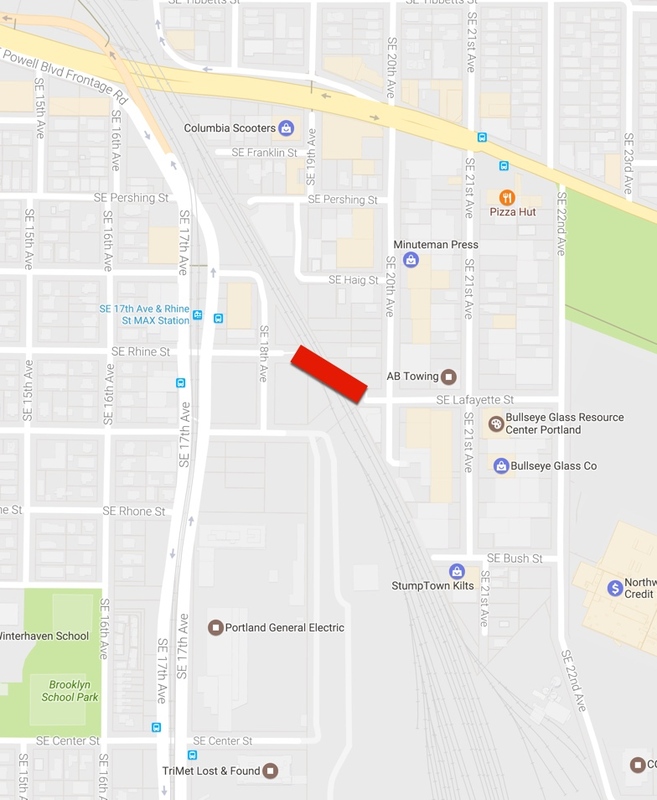 For bicyclists, there are a couple of work-arounds (emphasis on “around”) to get over the RR tracks that are not hideously far out of direction, depending on where you’re headed. There are paths on both the north and south sides of Powell, where it dips under 17th/railroad overpass, that’ll get you through. It can be sketch-o-matic down there, as underpasses tend to be. Not great, but worth mentioning because it’s not readily apparent. Not saying that TriMet shouldn’t fix this elevator. It’s particularly bad for our walking brethren, for whom out-of-direction travel is even more of a hardship and time-sink. “Sketch-o-matic” doesn’t cover it. Not safe. 21st to Clinton is the far preferable route for cyclists. This bridge is how I get to 21st to get to Clinton. Or I would, if the elevator still worked. The Central Eastside is becoming the place to be, especially with the Goat Blocks development opening in May. There need to be overpasses or underpasses at at least 5-6 points at rail crossings, even if only for bicycles and pedestrians. And with no stairs or elevators, but ramps! – the inclined plane, a simple, mature and inexpensive technology. This really isn’t complicated. One of the pedestrian bridges over the railroad tracks north of Powell Blvd was removed during the Orange line construction. It was not replaced. TriMet promised to replace that bridge if the project came in reasonably close to budget. It did, and they didn’t. But yet the TriMet rallying call is for “better” car freeways. whose responsibility is the bridge? i guess i didnt understand from the prev article. i know trimet made it but whose land, who paid, is it public or private access? moisture should not get into any structure that it is not designed for, so its an obvious fault. that trimet cannot even afford an estimate to fix means its not going to happen. im more curious on who is responsible for making the bridge in the first place. jonathan could you help with that. like the rights, obligations. probably like last time i commented im missing something big. thank you for getting us this news on the bridge. The bridge is TriMet’s responsibility. They built it for $3.9 million as part of the Portland-Milwaukie Light Rail project. Union Pacific RR is the other entity involved. They pitched in $1.7 million for the project because it also goes over their railways. I also have a lot to say about the lack of clearing of ice from the steps during the snows, because often the elevator wasn’t working then either. My teen and friends helped a woman carry her kids plus stroller up/down the icy steps one morning and were appalled. Your sidewalk, your responsibility to quote PBOT. While this is an inconvenience for cyclists this is an absolute nightmare for anyone with mobility issues. It’s unacceptable that it’s been out of service for so long for this reason. After seven weeks they don’t know what caused it or when it will be fixed. No need to say more. If they had wanted to, they could have assessed the problem and had a repair scheduled within a week. It might take longer to receive parts, schedule crews, etc., but they’d have a target date for returning it to service. TriMet’s Board is appointed by the Governor and, according to its website, three of their terms expire in 2018. Don’t know if any have been reappointed yet. We should contact the Governor. If you need an elevator, you need two elevators. Shoddy, half-broken infrastructure is unfortunately the new normal in America. It’s only going to get worse unless we do something about it. Portland Police Bureau, on the other hand, just requested $2M for more protest-quashing rubber bullets. Shows where the state has their priorities — they’d rather shut people up than provide quality transportation infrastructure. So the PPB requested that…doesn’t mean they will get it. They all come out of the city’s budget, which is a finite amount. The more we spend on arming police with military-grade crowd-dispersal weapons, the less we have to spend on other things. About a decade ago or so during a period of massive “general funding” budget cuts, PBOT was using only “general funding” to pay the street lighting and signals electricity bill. When PBOT was ordered to cut that bill significantly (i.e., use infrastructure and parking revenue to pay for electricity), PBOT presented council with a brownout plan, to cut power for street lights district-by-district, depending upon the day of the week. The Police Bureau was horrified – they knew from other cities precisely what happens afterwards – and stepped in to cut their own budget to keep PBOT from cutting theirs. Shouldnt something built outdoors in Portland be designed for the rain? KATU did a story. It seems like Tri-Met may need to be shamed into action. And this a bit tangential, but I’m back to the old SE 21st + Clinton hustle, which IMHO has gotten worse traffic wise since the installation of the diverter on Clinton. Yeah, less cars run the full length of Clinton, but it feels like 5x as many are zigzagging through every imaginable side street instead. Every intersection has a car aggressively poking its nose out, all too often making dangerous turns and crossings. The cut through traffic on the smaller parallels to Clinton is definitely worse. Both numerically (as verified by counts) and in terms of aggression and impatience. I fear failure to deal with this will make future diversion more challenging as residents nearby say “not here”. It would be worse if there was an active opposition. Not really; there was some grumbling, but the NA was firmly on board, and there was no organized opposition. I seem to recall hostility from bike portland commenters when I and others were very critical of the elevator as an option. Yes, you are right. So, let’s all remember this: never accept elevators as bicycle infrastructure when rideable ramps can be built. Never again! Yes, the left turn signal at 21st across Powell needs to come back into focus, so riding your bike across Powell at 21st can become a touch more safe. Something like what’s being built at 28th would work well. An elevator should never have even been considered here. There is no need for an elevator or stairs, only properly designed ramps at either end of the bridge. There are lame excuses for an elevator, but this perfectly illustrates why they are pathetic excuses. PP&R made similar lame excuses when it built the Waud Bluff overcrossing that terminates in stairs and excludes a large percentage of the population. You CAN justify these terrible design failures with the Americans with Disabilities Act, but no one should get away with that in 2017. While an inconvenience, surely 99.9% of riders can use the stairs? I’ve often crossed over at the Hollywood station, and can’t imagine taking the elevator when they built the stairs and ramp to make it easy to use with a bike. The stairs are MUCH higher than Hollywood. I use them, but understand why others might not. Lots of people with kids use this connection, myself included. The stairs are way too steep and long (probably 40-50 of them) to consider trying to haul a bike laden with a kid or a cargo bike up there. Even with my normal commuting load (laptop, lunch, etc.) I’d rather avoid the stairs; the bike gutters don’t help at all. Not sure if everyone’s like me, but I’d guess these conditions apply to a lot more than 0.01% of riders. But I agree with Hazel that the big issue is not inconvenience for cyclists, but impassability for people with mobility issues. 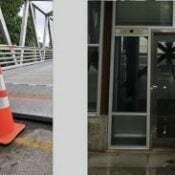 Both from a transportation perspective–they may not be able to take an alternate route–and from a legal one, because there are laws requiring ADA compliance. Jonathan (Maus), thanks for keeping this issue in the news. stairs are not good for people with a cargo bike, bike trailer, younger kid on a bike, kid in a bike seat, many older people cannot carry a bike up/down stairs, people with mobility issues. This may not exclude a majority or Portland citizens, but it sure as hell is more than 0.01%! Maybe it’s not anything more than an inconvenience for you, but I wonder if you have ever used it. The steel channels that are supposed to help guide one’s wheels when using the stairs are slippery when wet – dangerously so. Any long wheel base bike (cargo bike or tandem) ends up hitting the rail where the stairs transition to flat. 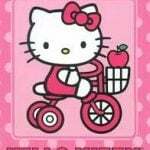 I used to regularly use the elevator with my spouse or child on the tandem. Now I seek alternative routes. I can’t carry any of my bikes up a flight of stairs. Even the Brompton is challenging. a)They could have put in a bike gutter up the center of the stairs and b)They could have put in a circular ramp right in the middle of the street. But..no. Cars need those two spaces. A ramp can never break down. What’s with all the tents on the bike path that goes under 17th? That’s the alternate route to this closed elevator heading from the 17th Ave bike lanes up to 19th and Clinton. I squeezed through there with a single bike, but don’t believe my trailer would have fit around the biggest tent. The city/TriMet cleared out the tents from along the Orange Line and on the Hawthorne Bridge ramp and fenced off the areas. The people living there had to go somewhere. Went under 17th this morning and there is only about 8″ between tent and wall. Had to lift the bike overhead to get through. You can call the police; they’ve committed to keeping the path clear, even if they allow people to continue camping there. Once again, could Bike Portland leave the readers with a contact at Trimet that we can reach to voice our concerns? You have so many readers that it would be beneficial to share that kind of action item. I use this bridge all the time, and the other weekend I saw a dad with a young child hauling a trailer up the stairs by himself. It was absolutely ridiculous. Trimet needs to hear our stories and concerns. I don’t usually contact Trimet, and I have no idea which contact would be the best to reach for this sort of item. Anything helps. Calling the old bridge sketchy is the understatement of the year. On the other hand, I liked it, and found the lack of stability, the cobbled-together railings, and just the sheer danger of the structure appealing to the libertarian in me. Well that’s what all the teens called it, and it stuck for our family (we still call it the sketchy bridge, even though it’s not anymore). Did Trimet get this elevator at some kind of discount elevator store, or a light night infomercial? It had to have been engineered and manufactured by a legitimate elevator company that should have provided some kind of warranty and long term service. My guess is there was some kind of screw-up in the elevator procurement process and the responsible partys inside Tri-Met are playing pass the hot potato and trying to avoid blame. It slices! It dices! It lifts people up! Call now to get this free beautiful crystal zirconium pendant with your order! Three easy payments! Operators are standing by! Call now! Uh, maybe the vents at the top of the shaft at a 90* angle to the EcoDisk system? That elevator will definitely shut down when the Big One comes, or even a Little One. The stairs could very well fracture too. A ramp would probably be easily fixable if it did have a propblem. I like ramps too, but it is an interesting exercise to see how long a ramp would have to be to get up high enough to cross the tracks. The bridge is maybe 30ft tall, and assuming a 5% grade, and ignoring the resting spots which will extend the ramp by a bit, I calculate a minimum of 600ft of ramp, on either end, probably closer to 650ft once the flat rest spots are put in. I can see what TriMet didn’t want to build this — it would be expensive, and where would it go? And even then, an elevator may be more suitable for many users, for whom a 650ft steady climb would be daunting. Also, unless well designed, it would have the potential of adding 1300ft to the distance it takes to get across the tracks. Parking garages have circular ramps. Denver has a circular ramp. I even saw a circular ramp that crossed in Wyoming once. It isn’t rocket science. The Morrison bridge has a circular ramp from the Esplanade. Oh right, and the Concord Curly-Q has two. And the 9th street bridge over Powell about 10 blocks from here also has a circular ramp on both ends. It’s much lower, and not ADA compliant. I worked out the geometry in my head, so it’s not particularly accurate, but I don’t think a circular ramp can work given the laws of geometry. That one isn’t ADA compliant. Thanks for the update. Here is a statement Tri-Met provided KATU. They didn’t seem to care until it became bad PR. 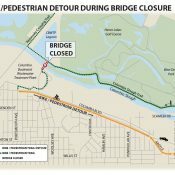 When has a road or bridge that is well used be shut down for 45 days over a little bit of water? They seem to have adjusted the brakes as well. No more audible relay thunks when it starts and stops. I do love the two fans just hanging from the top of the shaft. Still don’t know why they didn’t install fans in the first place. Or why the elevator compartment exhaust fans never blow/turn, even when it’s 120 degrees in the elevator. The elevator is painfully slow though. usually I’ll just run up the steps. Steps are def sketchy in dark. Powell needs some bicycle overpasses. Update: The elevator was running again Monday morning. There were several large blowers at the bottom of the elevator shaft. I’m guessing that means TriMet has a stopgap solution to keep the mechanism dry, but hasn’t found a long-term fix yet.